SPANISH EDITION. Dr. Charles Stanley helps those who are experiencing hard times by helping them make sense of why God allows us to be broken. - Publisher Perhaps you've already experienced circumstances so shattering you may wonder today whether it's even possible to pick up the pieces. And maybe you can't. But God can -- and the good news is, he wants to reassemble the shards of your life into a wholeness that only the broken can know. 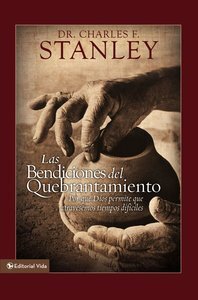 About "Bendiciones Del Quebrantamiento, Las (Blessings Of Brokeness)"
Perhaps you've already experienced circumstances so shattering you may wonder today whether it's even possible to pick up the pieces. And maybe you can't. But God can -- and the good news is, he wants to reassemble the shards of your life into a wholeness that only the broken can know.